I have to admit that I’m a sucker for the Sky Mall catalog on airplanes. While it’s true that I don’t buy everything I like, I like more things in that catalog than most others I peruse. Why is that? Could it be as simple as the fact that I’m a captive audience while flying? Hmm, I doubt it. I think it’s because that particular catalog is really a compilation of items from numerous companies. That means it shows a wide variety of items in an effort to attract the largest number of buyers. Since I’ve never been able to look at that catalog without tearing out pages of things I want, consider this fair warning that I’m going to highlight a few of my favorites over the next few posts! Let’s start with this 9-foot Umbrella Screen. Haven’t we all fought off flying insects while trying to eat on the patio? Even to sit outside under my table’s umbrella to have coffee… alone… would be great. If you’re like me, you want the only things moving under the umbrella are the people I’ve invited to share the table with me! Imagine being able to enjoy your patio table and be free of mosquitoes, bees, and flies! Made of see-thru black mesh polyester, this umbrella table screen slips easily over any patio umbrella up to 9-ft. in diameter and has a large zippered entrance for easy access. Yes, it actually lays on top of your umbrella’s outer edge. There’s an adjustable cinch top so you can tighten it to fit your umbrella properly. If it’s windy out, you can fill the tube at the bottom of the screen with water to add weight so it stays in place rather than blowing around. This umbrella screen is lightweight and is easy to clean by hand washing in cool water and air-drying. Now keep in mind that, while this could make for much enjoyable outdoor living, it is intended for 9-foot table umbrellas. That means you need to have a patio table that’s only about 3-4 feet in diameter so your chairs have room to sit around the table inside the screen. My own table is only about 42″ in diameter so this would be perfect on my patio. We have a packet of Bok Choy seeds sitting around here. Yes, that’s a vegetable. When we bought the packet we were buying some other vegetable plants this summer and had spotted it as we were checking out. The seeds weren’t to be planted until fall so we set the packet aside. Well, it’s the end of October and we still haven’t planted those seeds. Why? Well, you know how time flies, don’t you? One minute it’s the middle of summer and you’re concentrating on harvesting your first ripe tomatoes… and the next you’re thinking it’s too late to plant those seeds. Has this happened to you, too? Well, no more! There’s a web-based company in San Diego that will help us have a full harvest by sending us seeds when it’s time to plant them… or, for no cost, they’ll just send us reminders to plant. How sweet is that?! Check out SproutRobot.com. Just give them your zip code to get your personalized planting calendar. 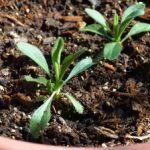 They have different pricing options if you’re interested in their certified organic heirloom seeds with instructions for planting. Have a Bottle on Me! I love things that are different than the norm. They really add that unique touch to any form of decorating. And, of course, when that unique touch is on the outside of your home you’ve really drawn the eye of everyone who walks or drives by. Some time last year I saw a bottle tree on television and fell in love with it. Since I didn’t follow up with it right then, I lost my chance to get one. Imagine my surprise and delight when I happened across their website! The design is actually fairly simple and very clever. If you know how to weld, you could probably make one yourself but I’m more clumsy than adept and would probably end up with a body part attached to the tree. Ouch! Plus I’ve learned over the years that when I start thinking that I could easily make it, I don’t buy it and then never make it either. Double whammy of being a crafter! What’s great about these trees is that you can get the shape that works best for your landscaping and then pick the color of bottles you want to use. I prefer the multi-colored versions … probably because I can’t decide on just one, but that’s just me. What’s really fabulous about these is that they fit in great with any landscaping, particularly xeriscaping … they don’t require watering, after all! If you’re like me, you love the sound of water running while you’re relaxing out back. Of course, it loses a little something if you’ve had to prop your garden hose on a rock to create that sound! I ran across this video and thought you might enjoy it. I haven’t yet created my outdoor pond, but now I have a better idea of what I can make the water do to keep me relaxed and enjoying the ripples. My current house was built in 1959 and doesn’t have a doorbell. There are many people who have forgotten that doorbells did not always come with every home and that door knockers were common. Although the doorbell was invented in the 1800s, they did not become the norm until much later. I remember my grandparent’s home having a twist-style ringer rather than an electric bell, much like a bicycle bell. In fact, I’ve even lived in older houses with similar doorbells. Many apartments still do not have individual doorbells other than perhaps for the street entry. Given all this, isn’t it funny how strange we find it when we can’t find a doorbell to ring near the door. have people bang on the door with their hands. The wireless doorbell is quite simple and a good solution for people that don’t own the house or apartment. The button can either be screwed to the outside wall or stuck to the wall with double-sided foam tape. Inside the house you place the chime part of the set. I actually tried this. It worked well for a while but eventually the doorbell would ring on its own … day and night … and was driving me crazy. I finally figured out that the four heavy batteries operating the chime section were not staying upright in the battery holder and this would set off the chime. Unfortunately, no matter what I tried to keep the batteries in place they would eventually loosen just enough to set the chimes off. You can picture me dealing with this much like that smoke detector that goes off unexpectedly. After removing the batteries in frustration several times , I finally gave up. Not to completely turn you off if this is your best choice, I didn’t bother trying another make or model so I may have just owned a lemon and that can happen with nearly anything. The next option, and usually the most popular, is to run electrical wiring that will allow you to install a doorbell. 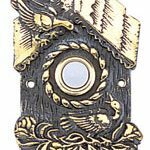 One reason this is so popular is because there are many decorative electrical doorbells available that are fabulous and would add to your outdoor decor. 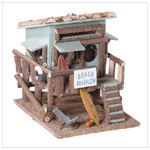 Depending upon your outdoor decor theme, you can use a birdhouse, grapevine, sailboat, gecko, or any other design. 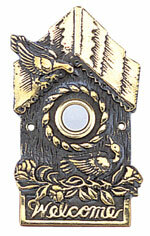 Button doorbells are more common in decorative designs. Wiring a house for a doorbell is fairly simple as a rule. The electrician merely runs a wire between the studs and make a hole in the outer wall where you want the doorbell. Personally, I prefer this method over the non-electrical choice. A door knocker was the best choice for my house. Although this usually creates images of big mansions for me, there are a variety of styles to fit any size house or outdoor decor. 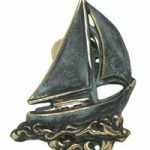 Whether you prefer the more traditional lion’s head version or the decorative grapevine, bird, or sailboat, there are designs available. One of the advantages of a door knocker, of course, is the fact that you have no need for electrical wiring if you don’t already have it. Another is just the image a door knocker invokes (at least for me), plus visitors can knock as loudly or softly as they wish. If your house has a security door that prevents people from reaching the front door, I would recommend that you install the knocker on the outside wall just to the side of the door. You will still be able to hear it and it will still look nice. You could even create or buy a wooden plaque that you install it on before installing it beside your door. Whatever your preference, don’t let the lack of electricity or access to your front door prevent you from making a stylish choice that adds to your curb appeal. Your visitors will appreciate the decorator look, your efforts, and the fact that they no longer need to try to get your attention with their knuckles or fists. Residential architects report that there has been a sharp rise in the popularity of outdoor living space, upscale landscaping, and outdoor amenities. More attention and investment is now being devoted to enhancing individual properties as the overall size of U.S. homes has begun to level off after decades of expansion. These findings are from The American Institute of Architects (AIA) Home Design Trends Survey for the first quarter of 2006 that focused specifically on overall home layout and use, and compared these trends to the 2005 results. Demand for outdoor living space was 64% in 2006, an increase from 47% in 2005. Demand for upscale landscaping was 56% in 2006, compared to 48% in 2005. Demand for outdoor amenities was 43% in 2006 and only 30% in 2005. Demand for lot boundaries was 30% in 2006 and 25% in 2005. This is just part of a press release issued by The American Institute of Architects. If you’re a homeowner with a yard, you probably have a garden hose lying coiled somewhere in the yard like a snake waiting to attack. May I suggest a garden hose holder or hose pot? If you’re like me, you either have tried or inherited various garden hose storage methods. My house came with two very unattractive garden hose holders screwed to the front and back of the house. I mean it when I say they were hideous. It might not have been so bad if some attempt had been made to hide them behind the plants or bushes around the house. But, no, they stood out proudly above everything around them. Okay, I’ll admit they bothered me enough to remove them and let my garden hose coil on the ground. Sadly, that was an improvement! In the past I’ve also tried those wheeled contraptions that let you unwind and wind up the hose like you’re reeling in a fish. My fun was short-lived, however, because the hose kept getting tangled up somehow. I stopped using it once I realized I was spending more time “managing” the hose than using it. Today, my two favorite storage methods are the garden hose holder that attaches to my home and the garden hose pot that I can leave in a convenient place. You might think I would have avoided the attached garden hose holder after my previous horror story. However, my horror was directed toward the appearance of the ones that came with my house, not the general idea. Since most outdoor water faucets are connected to your house, it makes sense to have your garden hose close by. 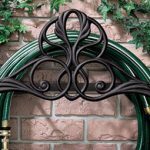 You have to admit that an attractive garden hose holder, like the Victorian-themed one pictured, makes a world of difference! There are many styles available today and you can choose hose holders that best fit with your home and garden decor theme. The garden hose pot sits on the ground, so you can easily place it near a bush that can partially hide it if you prefer. However, if you choose one that goes well with your garden decor there is little need to hide it. There are many garden hose pots available, but be sure to choose one that fits your needs as well as your garden decor. A garden hose pot should have a sturdy center post to keep the hose properly coiled and a large enough hole at the base to run the hose through for easy attachment to the faucet. This allows you to place the hose pot farther away from the faucet and closer to the area where you will use it. Don’t forget that the run of hose from the hose pot to the faucet will be visible unless you can hide it with surrounding plants. 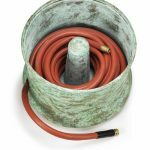 The brass hose pot pictured has a verdigris finish to match any aging copper accents you may have. 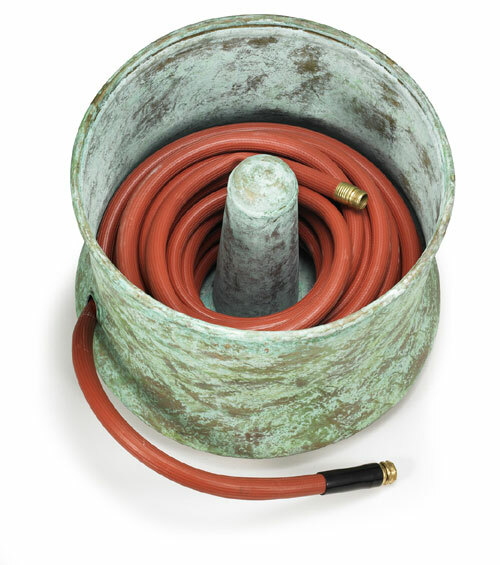 The most important feature of this particular hose pot is that it holds up to 150 feet of garden hose. 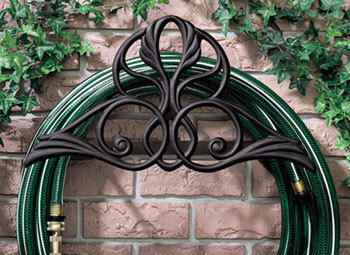 Make sure that any garden hose pot you are considering can easily hold the full length of your garden hose. An overfilled hose pot is not going to be adding to your curb appeal or your convenience when trying to store your garden hose. Are you in need of a very simple and inexpensive way to add a decorative touch to your yard or garden? Well, I have the answer for you. In fact, you’ll be recycling something that might have otherwise ended up in the garbage. Plant that broken ceramic or terra cotta pot in your garden! Although you can use this technique with a new pot, it’s even better if you salvage a broken pot and give it new life. If you have a ceramic or terra cotta pot that is cracked on the lower half, you have a good candidate for this project. I prefer pots that have an undamaged top rim but, depending on your goal or vision, the choice is yours. 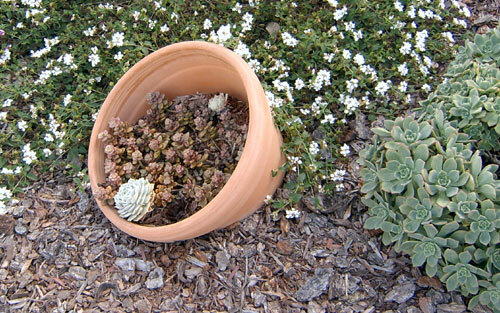 Plants in terra cotta pots are notorious for drying out faster than in plastic or glazed ceramic pots. Since you want the plants inside the planted pot to receive an equal amount of water as the plants around them, it is necessary to open up the bottom half of the pot. The method for doing this is to lightly tap a hammer around the drainage hole in the bottom of the pot, breaking and removing the bottom. Be very careful because you can easily remove more than you had planned. The pot in this picture was nearly a victim of a heavy hand. However, the missing side of the pot was easily hidden by keeping that side facing the ground. Once you have the bottom removed, it’s time to plant that pot. Dig a fairly large hole because you want plenty of room to position the pot just how you like it. 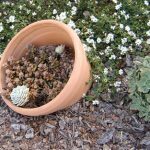 Make sure you leave enough of the pot showing above ground to account for any ground cover you may use around or near it. Fill in the area outside the pot with dirt first to ensure the positioning doesn’t shift, then fill the inside. Keep in mind that you may have the pot tilting (as in the picture), so you could end up with less planting space than you had planned. 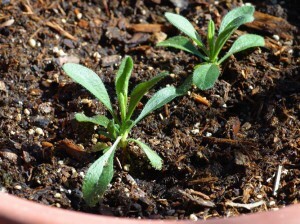 Use plants that will remain fairly small or they will quickly overcrowd the pot. The pot in the picture is approximately 15″ in diameter, but an interesting display could also be produced with a grouping of pots of various sizes. Have fun with this inexpensive and fast method for adding an interesting accent for your yard or garden. Don’t forget to send me a picture of your successful use of this idea. Weathervanes are available in several sizes and choosing the correct size can enhance the weathervane’s impact on your outdoor decorating theme. If you have only seen a weathervane on someone’s roof, you are in for a surprise. 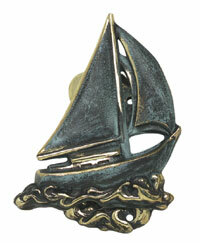 Weathervanes are now providing decorative accents for the tabletop, mantel, and shelves. Garden weathervanes are also providing an attractive touch to yards and gardens. And, yes, rooftops are still a very popular location for large weathervanes. 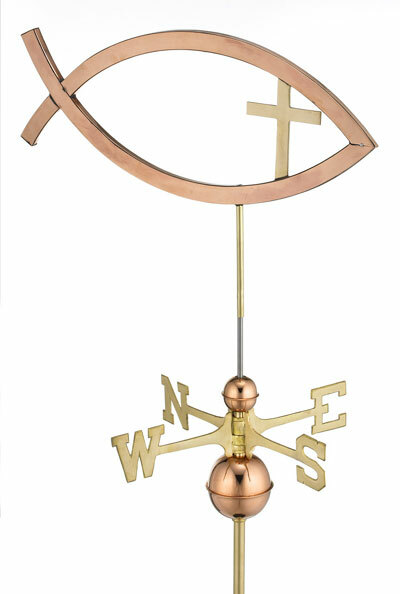 You have two choices to make when selecting a weathervane. I think choosing the weathervane’s location is the first choice. Once you know where you might like to put a weathervane, you can then look at the designs available for that location (tabletop, mounted on a stake in the yard, or roof mount). Are you looking a decorative accent to add to your indoor home decor? 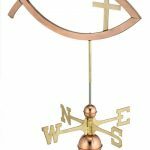 ReviewÂ tabletop weathervanes that come with a base and stand or the larger ornament from a cottage weathervane (also called garden weathervanes). Just so you know, “ornament” is the term used for the weathervane’s main figure. 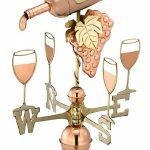 Although the garden weathervane’s ornament would be too large to mount on the standard tabletop weathervane base, you could mount the ornament as wall decor. 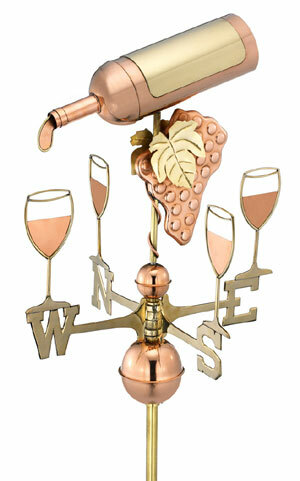 Do you want to add a decorative weathervane to your yard or garden? Cottage or garden weathervanes, and even some full-size weathervanes, are mounted on a pole for this purpose and usually end up 5-8 feet tall overall. This height allows the garden weathervane to be easily visible in your garden or yard. The garden weathervane’s popularity has grown over the years, resulting in numerous unique and interesting designs. Although this is my personal favorite size, I must warn you that the garden weathervane will not be an effective wind tool. Most of our homes today are surrounded by numerous fences, bushes, and trees that will dramatically reduce a garden weathervane’s ability to point out the wind’s direction. Rooftop weathervanes have been the most popular style over the years and rooftops are the traditional location for weathervanes. Rooftop weathervanes usually range in height from 30″ to 5 feet. Since you may not want your house to look like a huge alien rooster just landed on it, be sure to choose an appropriately proportioned height for your roof. As a general rule, cottage/garden weathervanes (ornaments of 8″ to 15″) are great for pole mounting in your yard or mounting on the roof of a small garage, gazebo, or shed. The full-size weathervane (ornaments of 12″ to 20″) can work in the garden if it’s toward the smaller size or on the roof of a garage, a house with a long roof line like a ranch-style home, or a slightly bigger structure. The really large weathervanes (ornaments 20″ and up) create the biggest impact on commercial buildings, barns, or larger homes. Keep in mind that the ornament heights discussed do not include the extra inches of directionals (the north, east, south, west piece) and spacer balls that are part of many weathervanes. Choosing a weathervane size that fits your purpose will result in an attractive addition to your outdoor decor. Remember that you want your weathervane large enough to be noticed, but not so large that the weathervane overpowers everything around (or under) it. Are you making mistakes when choosing the birdhousesfor your yard? Are the birdhouses you’ve selected for you or for the birds? There are major differences in birdhouses and I’ll keep it simple by saying there are two main categories: decorative birdhouses and nesting box birdhouses. Decorative birdhouses are my personal favorite because I can pick designs that work well with my outdoor decor theme or designs that are just fun to see in my yard. I have a lot of fun choosing an eclectic variety of designs but other people will want to follow a specific theme. You can also pick a variety of locations for decorative birdhouses: on a pole, hanging from a tree, or attached to a fence. It is important you choose decorative birdhouses that you love because you’re buying them for you, not the birds. This is definitely not a bad thing, it’s just something you need to remember. A decorative birdhouse is not your best choice if you really want to have birds nesting in your yard. It doesn’t matter if the decorative birdhouse is beautifully painted or wildly embellished, these decorations are rarely attractive to the birds. Most decorative birdhouses have a post or perch that is much more decorative than useful. In fact, that post or perch usually just helps the predators get into the birdhouse. Another negative is the opening. Most decorative birdhouses have a relatively small hole as the “doorway.” This would allow smaller birds to enter, but most of these holes are too small for the medium-sized bird. Decorative birdhouses are also not built to be opened for cleaning each season. Nesting box birdhouses are used for the sole purpose of providing birds with a home for their nest. These birdhouses are not particularly decorative because they are built to please the birds. They are usually made of plain wood, have ventilation holes, do not have a perch or post in front, and have a wall that opens on a hinge for ease of cleaning each season. Placement of nesting boxes is important. You want to keep them safe from predators and in a place where you won’t mind the mess the birds will leave below the birdhouse. In addition, you will want to research any specific requirements of the type of birds in your area. If you are interested in expanding the bird population in your neighborhood, look for nesting boxes or have trees where birds may nest. If you want to add a decorative accent to your yard and a smile to your face, check out my personal favorite, the decorative birdhouse.